We work to ensure that every aspect of the safety lifecycle is addressed in a way that promotes safe operation and full compliance with all relevant standards. Our continued SIRA re-certification to IEC 61508 underlines our dedication to maintaining the highest functional safety standards and commitment to current best practice, underpinned by the principles of integrity, transparency and consistency. We provide functional safety consultancy for complete systems including the provision of Technical Assessments to ensure that the required SIL is achieved. This c­an be independent of the technology of the logic solver and can include conversion of specification requirements into functional logic diagrams. A survey by Britain’s Health and Safety Executive (HSE) reveals that 56% of all accidents occur in spite of having a safety system installed, due to mistakes occurring at the analysis and planning phase. 44% of all accidents originate from incorrect specifications. In order to achieve safe operation which meets all the requirements of current standards, installation of a Safety Instrumented System (SIS) is a key element and other factors must be considered. 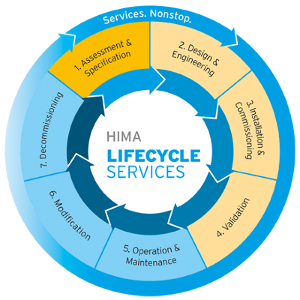 Safety considerations have to be applied across the whole lifecycle of a plant and this complex task requires in-depth and detailed specialised knowledge. With our functional safety personnel at your side, you can be sure from the outset to be making the right decisions and developing the right solutions: those that offer maximum safety and help strengthen the productivity and profitability of your plant.